Primera Air has announced the sudden cancellation of flights and declared bankruptcy, effective immediately. According to their statement, this was because they were unable to come to a continued loan agreement with their financial backers. The airline was a joint Danish/Latvian operation and had seven planes servicing 41 destinations. Primera, unfortunately, has had a string of problems with their service, with passengers complaining that sometimes flights will simply not show up and no refunds are given. They appeared to lose an aircraft to corrosion. Confusingly, they claimed that their Airbus fleet had been delayed, resulting in the usages of Boeing 737’s to cross the Atlantic (They did not have the range and had to refuel in Iceland). However, upon publication, Simple Flying was contacted by the PR team and told that this was not the case and the alternative explanation that was given was rather vague. “The reason also was not a delivery issue, as we have received all London and Paris A321neo units, it was due to operational reasons.” – Primera PR. They had big plans to go head to head with Norwegian over the next coming months, offering routes to Toronto and Boston from Europe. Unfortunately, because this bankruptcy was so sudden, there is no opportunity for passengers to get money back (They would likely be last on the list of refunds). As this airline is not part of the Civil Aviation Authority’s ATOL Protection scheme (Due to it being originally a charter airline), there is no protection for passengers. Flights leaving for America on Monday night were instantly cancelled, with a brief email being sent out to passengers telling them to ‘not show up’. Some passengers, particularly in Paris, were in the line to board the plane when it was announced that the flight had been cancelled. Passengers who have paid by credit card may be protected under their credit card insurance policies. The fleet of five Airbus planes will most likely be returned to Airbus for a fire sale. The Boeing 737’s were mostly on loan from a leasing corporation and will be returned. 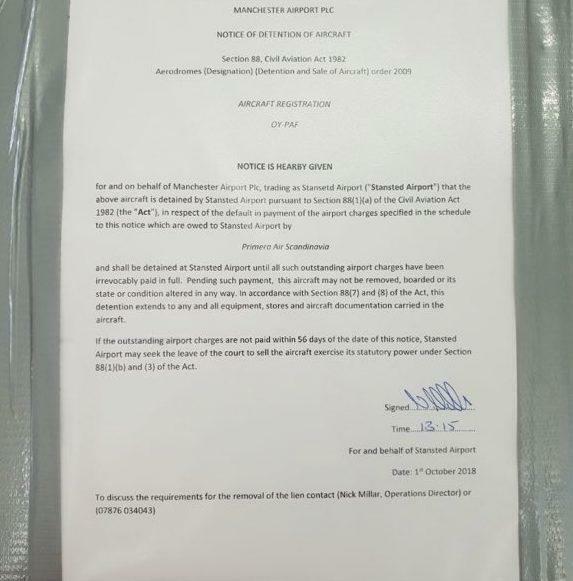 The notice on the plane door detaining the aircraft. The 300 staff will likely be given little notice and just stood down. Fortunately, with such a demand for aircrew, it’s likely they will find new employment quickly. The final flight to land was PF596 from Málaga to Copenhagen. It will cease operations as of midnight October 2nd GMT.